Back-to-back tech developments are making renewable energy sources more available and more viable. To that end, Tesla just unveiled the second incarnation of their commercial lithium-ion batteries: the Powerpack 2. 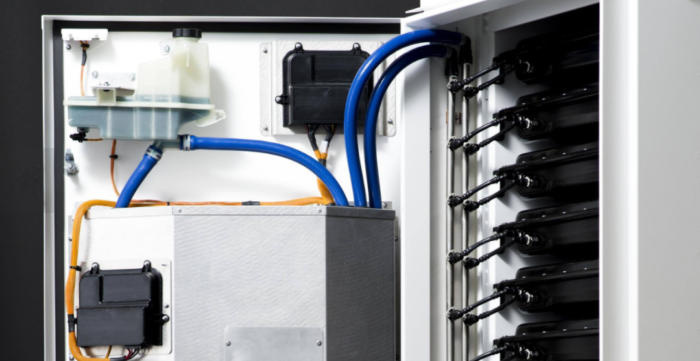 The new battery system “provides twice the energy density” over the original Powerpack, bringing the power capacity to a hefty 200 kilowatt hours. This power could cover the electricity consumption of an average American home for about six to seven days. The Powerpack 2 comes with a new inverter, and the press release on Tesla’s blog claims that it is the lowest cost, highest efficiency, and highest power density utility-scale inverter on the market. The inverter greatly simplifies installation of the Powerpack system and makes it compatible to multiple levels of the grid. The design of the entire system is such that while the electricity capacity is doubled, the system footprint is kept at the original level. With nearly 300 MWh of Tesla batteries deployed to over 18 countries, it’s a future that seems to be steadily ahead.